An up-to-date and two volume overview of recent developments in the field of chemocatalytic and enzymatic processes for the transformation of renewable material into essential chemicals and fuels. 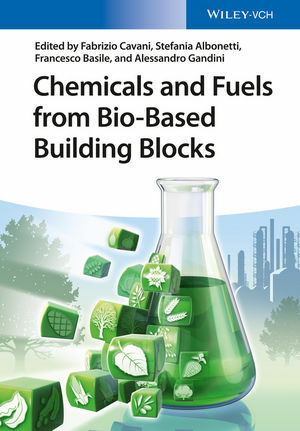 Experts from both academia and industry discuss catalytic processes currently under development as well as those already in commercial use for the production of bio-fuels and bio-based commodity chemicals. As such, they cover drop-in commodity chemicals and fuels, as well as bio-based monomers and polymers, such as acrylic acid, glycols, polyesters and polyolefins. In addition, they also describe reactions applied to waste and biomass valorization and integrated biorefining strategies. With its comprehensive coverage of the topic, this is an indispensable reference for chemists working in the field of catalysis, industrial chemistry, sustainable chemistry, and polymer synthesis. Fabrizio Cavani is Full Professor of Industrial Chemistry at the University of Bologna, Italy, where he received his PhD in 1986. From 1986 until 1990 he worked at the Catalysis Centre of EniChem in Italy, where he was in charge for the R&D of new catalytic materials in the field of selective oxidation and acid catalysis. He then joined the University of Bologna where he became Associate Professor of Industrial Chemistry in 2000. He has authored around 200 papers and reviews in the field of heterogeneous catalysis, two books on catalytic selective oxidation, one book on the development and management of chemical processes. He also holds 28 international patents, some of which have been industrialized. Stefania Albonetti is Associate Professor at the University of Bologna, Italy. She obtained her PhD in Industrial Chemistry there in 1996. She then worked for Lonza SpA in Bergamo (Italy) where she was responsible for the catalysis department. In June 2001 she joined the Department of Industrial Chemistry and Materials at the University of Bologna. She is the (co-)author of 78 journal contributions and ten international patents. Since 2013 she coordinates the Erasmus Mundus Doctorate Program in Industrial Sustainable Chemistry (SINCHEM). Her scientific interests are the technological application of material science and heterogeneous catalysis directed to the solution of environmental problems, such as the design of innovative materials for more environmental friendly industrial processes. Francesco Basile is Associate Professor at the University of Bologna, Italy. He obtained his PhD in Industrial Chemistry in 2000 and in 2003 became Assistant Professor at the Department of Industrial Chemistry and Materials at the University of Bologna. He is (co-)author of 63 publications and co-inventor of ten patents. He was scientific director of two European summer schools on next generation fuel from Biomass(2006-2009) and board member of European projects. From 2009 to 2012 he acted as consultant in Biofuels and added value products from biomass at the International Centre for Science and High Technology UNIDO. His research is focused on the synthesis of new materials and catalytic processes in the field of gas cleaning, hydrogen/syngas production and biomass transformation in fuel and chemicals. For the last 56 years Alessandro Gandini has conducted research and teaching chronologically in Switzerland, the UK, Canada, the USA, Cuba, Canada, France, Brazil, Portugal and now in France and Brazil, with invited professorships in numerous other countries. Polymer chemistry, photochemistry and surface science have dominated his professional interests, with a progressively growing involvement in polymers from renewable resources, a topic he was one of the first to investigate and promote.